Alexis has come to her senses and cancelled her trip to Rio to disrupt Blake and Krystle's honeymoon. Even if Alexis did not cancel the trip on her own, Dex was going to stop her from going anyway. Dex goes to the Penthouse and tries to prevent Mark from leaving which leads to a tussle between the two. Alexis arrives and tells Dex that he can cancel the reservations if he wishes. When Dex attempts to do so, he learns they have already been cancelled. Alexis tells Dex that no one cancels her plans but herself and kicks him out of the penthouse. Kirby is very eager to get the divorce. Funny, when Fallon wanted a quick divorce last year, she had to go all the wait to Haiti. Now, Kirby and Jeff can get a divorce in 90 days. Well, why did Fallon not do that before? I guess scenes of Kirby in Haiti would be boring as any scene with Kirby tends to be. Jeff tells Kirby that they will speak to Andrew shortly since there are no other attorneys in Denver. Besides, Andrew is too busy catching Tracy in the confidential files room. Andrew is actually pretty prominent in this episode. Adam still wants a life with Kirby and Kirby continues to reject him. Further, Kirby is not feeling well. Now the pain in her abdomen is accompanied by a pain in the head - and that is not Adam. Adam warns Kirby that he will not allow her to raise his child as Jeff or as an Anders. The child is going to know he or she is a Carrington. In a first, the episode advances two weeks and there is a clip noting that it is "Two Weeks Later". Why not have the characters make reference to that? Wait, they do! Also, since Blake and Krystle are returning from Rio a viewer with half a mind can determine that two weeks had elapsed. Blake and Krystle are met by Fallon and Peter at the airport. Peter is really creepy but Krystle genuinely seems to like him while Blake seems a little apprehensive. Blake does not seem to like the idea of having Peter give flying lessons to Fallon since Peter is not a trained instructor. But, we all know that Fallon will do as she pleases. Additionally, Peter would not harm or kill his vested interested - namely, Fallon. Or, more accurately, Fallon's money. Remember, Peter owes these people in Italy $6 million. I guess it must have slipped their minds, as well as the cocaine use. He also owes Ernesto, an architect from Brazil, $2 million for the hotel he had built in Rio. The original bill was $3 million but Peter did pay him $1 million following the sale of Allegre. Undervaluing construction projects seems to be a habit as Adam let's Fallon know that the planned expansion of La Mirage (with a tower that seems out of place) is under valued. Fallon refuses to listen to her brother, and trusts Peter instead. Normally, not trusting Adam is a smart move, but he is right time. So there is this creepy man who hangs around the park and has taken a special interest in Danny. Danny's nurse, Mrs. Gordon, is concerned, especially after what happened to L.B. Claudia finds the man harmless. Now, we would probably consider the man a child predator. Okay, I am being harsh, but middle aged men without children who hang around parks are normally not considered innocent. Later, Mrs. Gordon contacts Claudia to let her know that the man followed them back to the apartment and is hanging out outside. 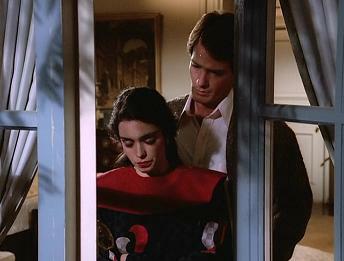 Unable to contact Steven, Claudia rushes back to the apartment and decides to temporarily move Danny back into the Carrington mansion. Blake is hoping to make the move more permanent. It would allow Krystle to have another child in the house without having to give birth to one herself. Somehow, Alexis learns about this temporary move and rips into Claudia. Claudia lets Alexis know that she considers Danny to be her son and she will put his safety before Alexis's need to hurt Blake. When Claudia came up with the plan to marry Steven, she forgot that would mean she would have Alexis as a mother in law. But, I got to hand it to Claudia, she holds up pretty well. Dex spent the two week interval in Australia where all he could think about was Alexis. Alexis did not even notice he was gone. Dex cannot get Alexis out of his mind and wants Alexis to let her guard down and to succumb to him. Alexis puts up a good front until Dex presents Alexis with a beautiful diamond and emerald necklace. The two make love, once again, in Alexis's office. Funny, people always seem to walk in and out of that place except when Alexis is entertaining. It actually took Andrew two weeks to prepare the divorce papers for Kirby and Jeff. Andrew questions both about whether this is what they want and even advises Jeff to reconsider it. (Interestingly, we learn that Andrew flew out to Korea and returned with the body of Jeff's father. I wonder what body he flew back with since Jeff's father turned up alive on The Colbys.) The divorce really is eating Andrew and Blake senses it when Andrew makes a big deal about Tracy going through the confidential files. (Blake does not seem to care about Tracy's actions.) Unlike many characters on this show, Andrew does not violate his ethical duty since he does not tell Blake about the divorce. The divorce is the least of Kirby's worries. It seems that her wedding band has cut off circulation to her finger and now it is swelled. Krystle gets Tony to cut the ring off Kirby's fingers. Oh, but it is worse, all of Kirby's fingers are swollen (and she has no manicure). Kirby wonder's what is happening to her. Well, I mean you have only been having medical problems for the last month - why should this come as a shock! Kirby: Your brand of love belongs in the alley, Adam. Alexis: Check with my secretary, he'll see if he can fit you in. Dex: No need to, believe me, we fit.